ZABUTON & ZAFU COMPLETE ORGANIC MEDITATION, YOGA SET, NEW SUPERIOR Corduroy FABRIC If by some miracle, your cushion starts to show signs of wear & tear, not only will we be astonished, but it would mean so much to us that you are spending so much time meditating on one of our products, we'll replace it absolutely FREE!! Just send the worn one back with a return address for the replacement cushion. We would be delighted to hear your experiences with the product, and any idea's you have to make our product even better! Customer service is always our number one priority, and we strive to give you the utmost satisfaction. Happy Meditating Tony The man who invented Buckwheat Pillows back in 1996. Description Traditional Organic Buckwheat Filled Buddhist Zabuton and Zafu Zen The set is ideal for lengthy meditation sessions, to protect feet and knees from cold floors during prolonged meditation sessions Zabuton Inner filled with 4 kg Organic Backwheat hulls and comes with a zip to facilitate removal of hulls either to adjust comfort or to clean fabric. Zabuton dimensions 29"X29"X2.4"/ 73.5cmx73.5cmx6cm The detachable outer is sealed with 10" velcro for easy removal should this cover require cleaning. We use top quality MOLESKIN, GABERDINE or COTTON CORD fabric as for zafu. 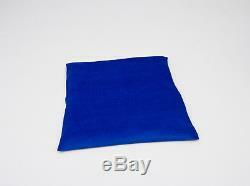 Or general floor cushion or for kiddies play room. The Zafu Meditation Cushion was traditionally used in Zen Buddhism to provide ideal support for cross legged positions in particular the Lotus Position, Half Lotus or Burmese meditation. The cushions have increased in popularity and are often found today in Health Clubs, Fitness Centres and are very popular in yoga classes. Your Cushion will help maintain posture by keeping the back straight whilst the knees rest on the floor to provide stability, an important factor during prolonged meditation sessions. Our Cushions are manufactured by us in the United Kingdom using only the finest of components, we use an Organic Buckwheat Hull filling sourced from Europe with a hard wearing corduroy fabric cover to ensure that your cushion will last for many years. The Cushions are supplied firm but can be adjusted to suit your own preference by adding or removing some hulls by means of a concealed zipper, also very useful when you need to remove the hulls completely to wash the cover, the cushion also features a carry handle for easy transportation. 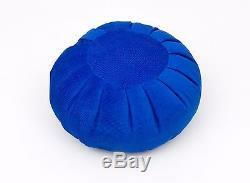 The Cushions approximate dimensions: 38cm/14" Diameter x 17cm/7.5" Depth at firm fill. 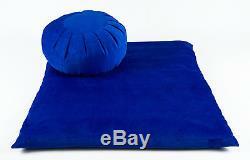 I have been meditating for 30 years, on three continents and your cushions are THE BEST I have ever used. I suffer from Spinal injuries, and these cushions have brought me great relief. I only wish I had an entire futon made by you, for I believe your workmanship is without equal. I thank you so much for what you have made and delivered. You've changed my life and health for the better, & I do have an autoimmune chronic pain disorder, -Fibromyaliga-6 blown disks & a kneecap.. Eamonnruane - ROI The Cushions Appearance: Circular top and bottom with pleated sides. Can also produce in the same ORGANIC CALICO as our superb Buckwheat Pillow FURTHERMORE Colours, specifications and dimensions of products. We have made every effort to display the colours, specifications and dimensions of items on the listing as accurately as possible. The colours you see will depend on the resolution of your monitor, we cannot guarantee that your monitor's display of any colour will reflect accurately the colour of the item delivered. Any offers or discounts are then automatically applied at checkout. Any problems just let us know. Combined costs are automatically calculated at checkout. The sooner we know about it the sooner we can put it right. When signing carriers manifest be sure to qualify your signature and carefully add detail to explain the problem :; "DAMAGED" "CRUSHED" "WET" "OPEN" as applicable.. Once you have signed received in good condition [this is most likely printed/embedded on the manifest]there is NO possibility of making a claim. In this case you MUST cross out :Good Condition. A replacement item will then be sent to you. ITEM HAS ARRIVED DAMAGED There is no need to return the damaged item. FEEDBACKS We don't expect each feedback to be like this one: That's it! So I bought the pillow, which I LOVE because it is made in England and it's organic.. After one night only, I woke up with no spasm in my neck and shoulders and that for the first time in months! My life has changed within a night! I have found the one... "Great Pillows-better than tempur" from Harry Jenkins, Bradford-on-Avon..
"The best pillow ever, and the best service" Gunnar Hoyland from Norway. In over 95% of customer dissatisfaction it is delayed deliveries which are out of our control. Please be patient and bear this in mind. The item "ZABUTON+MEDITATION ZAFU CUSHIONBLUE ORGANIC BUCKWHEAT FILL, CORDUROY fabric" is in sale since Friday, June 18, 2010. This item is in the category "Sporting Goods\Fitness, Running & Yoga\Yoga & Pilates Equipment\Other Yoga & Pilates". The seller is "aroma-relief" and is located in North Yorkshire Moors. This item can be shipped to United Kingdom, Austria, Belgium, Bulgaria, Croatia, Cyprus, Czech republic, Denmark, Estonia, Finland, France, Germany, Greece, Hungary, Ireland, Italy, Latvia, Lithuania, Luxembourg, Malta, Netherlands, Poland, Portugal, Romania, Slovakia, Slovenia, Spain, Sweden, Australia, United States, Russian federation, Canada, Brazil, Japan, New Zealand, China, Israel, Hong Kong, Norway, Malaysia, Singapore, South Korea, Switzerland, Taiwan, Thailand, Saudi arabia, South africa, United arab emirates, Ukraine, Chile.